Naples attraction-guides.com - Naples, Italy attractions guide Naples Pozzuoli and Phlegraean Fields information about attractions, Roman ruins, hometown of Sophia Loren, Pozzuoli amphitheatre, Via Domiziana, location and address, general tourist information about Pozzuoli City in Naples (Napoli) area, Italy (Italia) IT - Last updated 30/10/2012. Pozzuoli can be found to the west of Naples and is a small city, containing a wealth of interesting Roman ruins and historic artefacts. The city of Pozzuoli is also famous for being the hometown of famous Italian movie star Sophia Loren. Pozzuoli was once the main port of Italy and is within easy reach of Naples city centre. The Senate once seriously considered digging a 257 km / 160 mile canal to connect the Pozzuoli port to Rome in an attempt to make shipping easier. One of the main attractions in Pozzuoli is the grand amphitheatre on Via Domiziana, which is open daily and well worth a visit. 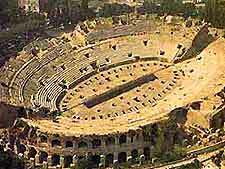 In Roman days, this was actually the third largest amphitheatre in the whole Roman Empire and over the years many important shows have been performed on the historic stage of the Pozzuoli amphitheatre. Other attractions at Pozzuoli, close to Naples, include the ancient Serapeum, a particularly grand marketplace which was once believed to be a temple to the Egyptian god, Serapis.